Globi starts out as an advertising character. In the midst of the economic crisis of the 1930s, he’s intended to boost morale. 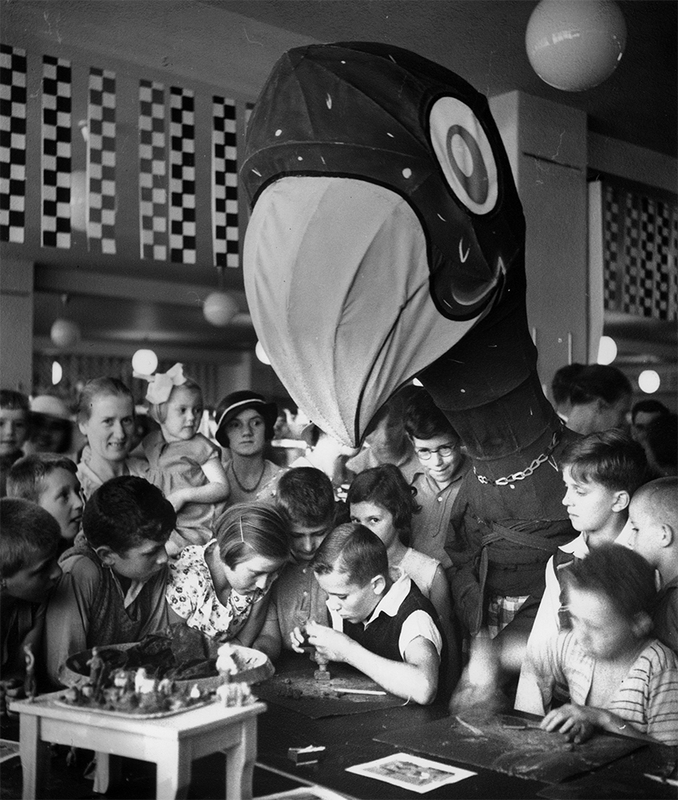 Children quickly take the jaunty bird into their hearts and set up their own Globi clubs. In the midst of the economic crisis of the 1930s, companies are looking for strategies to tap into new customer groups. This customer acquisition needs to be sustainable, fit for the future and designed to promote consumption, and it has to start with the youngest potential market – children. These measures are a great success in children’s entertainment, at a time when consumer leisure offers are extremely limited. 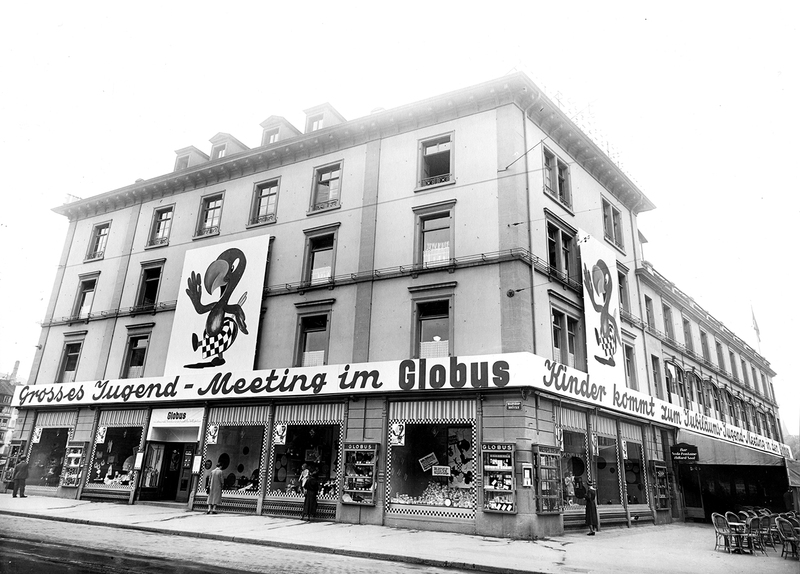 To mark the store’s 25th anniversary in 1932, the advertising department of the Globus department store, under head of advertising Ignatius Karl Schiele, creates a character that continues to this day to inspire and entertain generations of children. The African bird, drawn by Robert Lips, was originally named Kimbukku, but he’s re-baptised with the more PR-friendly name Globi. 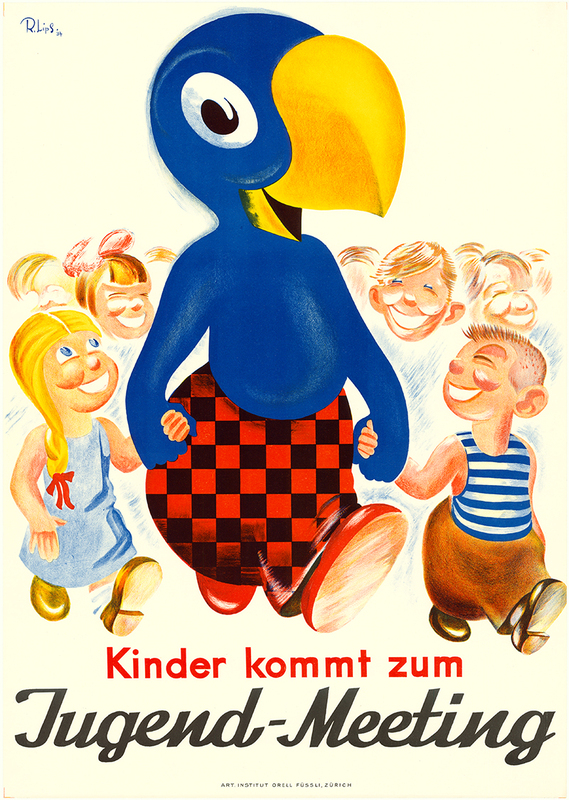 As a larger-than-lifesize cardboard mascot, the bird makes an appearance at anniversary celebrations, the so-called ‘Jugend-Meetings’ for kids, in Globus stores in Chur, Bern, Aarau, Zurich and Basel. In the unaccustomed setting of the department stores, children get to spend time, across 14 days, painting and doing crafts in the various departments. The entertainment on offer also includes shooting galleries, stamp exchanges and drawing competitions. Globi’s image promotes these events, which are repeated in the following two years. Globi is fast becoming more than just an advertising figure. 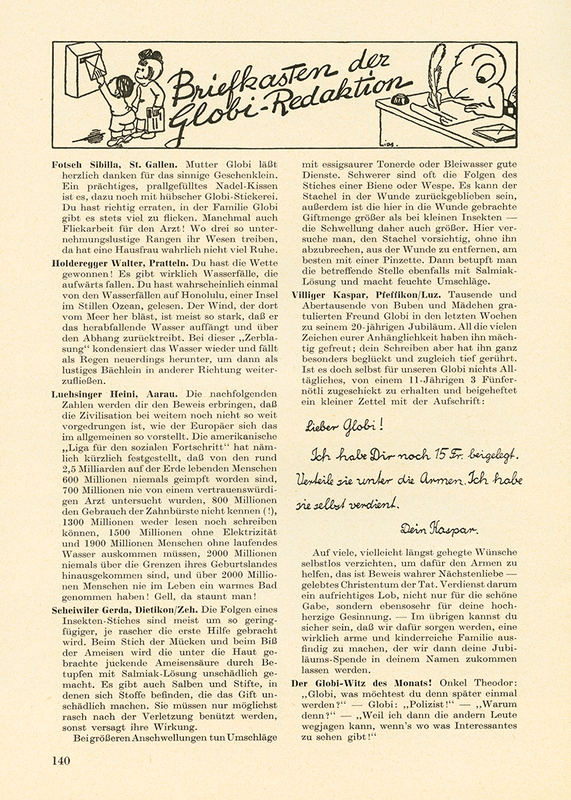 Over decades, Swiss children and adolescents grow up with ‘Der Globi’ magazine, published between 1935 and 1970. Also in 1935, the first picture book, ‘Globis Weltreise’ (Globi’s world trip), appears. The text missing from the first edition will later be written in poem form by Alfred Bruggmann. In particular, it’s this popular format of the Globi books, with their characteristic verse metre and black-and-white illustrations, that has since become so familiar to thousands of Swiss-German children. The enthusiasm for the character eventually becomes so great that in 1936 14-year-old Gottfried Brunner from Schwerzenbach, on his own initiative, sets up the first Globi club. By 1952 around 700 clubs, with more than 9,000 members, have sprung up throughout German-speaking Switzerland. The editorial office of the Globi magazine is delighted with this movement, sends every new member a personal welcome, and eventually devises a set of principles for the clubs similar to the Boy Scout rules; meaningful leisure activities, promoting comradeship and doing good deeds are to be points of honour for the ‘Globians’. In 1952, a then 11-year-old Kaspar Villiger – later a member of the Swiss Federal Council – encloses 15 francs of his own hard-earned pocket money in his letter to the editors, with the instruction that they distribute the money “among the poor”. In the many letters to the editorial team, Globi is called on to engage with his fans on all manner of subjects, and even acts as an ‘agony uncle’. This mail is diligently answered by the staff of the Globi editorial team. And by 1948, around 39,000 children are thought to have taken up the offer to visit the editorial office. But when the ‘kid culture’ takes a different turn after 1968, both the Globi clubs and the Globi magazine no longer fit the spirit of the times, and are closed down. Other companies have also tried to attract new customers with offers for children. Tune in tomorrow to read about how the Fip-Fop Club captivated children with mobile cinemas in the 1940s and 50s. Lisa Wenger’s Joggeli, who won’t shake down the pears, the kitten Pitschi, the children from the Maggi songbook or the teddy bear who sets off for Tripiti – these characters from Swiss picture books have captivated countless readers over many generations. Some Swiss artists, such as Ernst Kreidolf, Felix Hoffmann and Hans Fischer, have also become famous beyond Switzerland’s borders thanks to their illustrations. This family exhibition at the National Museum Zurich lets children immerse themselves in picture-book worlds and experience them through play. Adults encounter their once favourite characters in a cultural context. The exhibition is accompanied by a whole range of fringe activities to suit all the family. 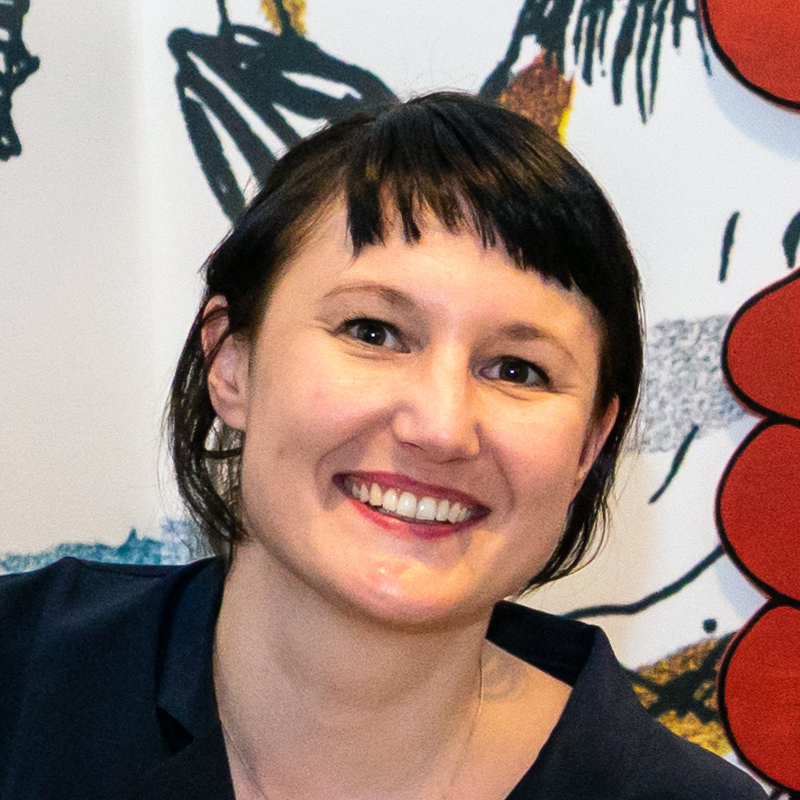 Anna Wälli hat Slavistik und Osteuropäische Geschichte studiert und arbeitet als wissenschaftliche Mitarbeiterin im Schweizerischen Nationalmuseum.